“Call Me…” is a sensitive and authentic literary adaptation that tells of summer romance between an older grad student (Armie Hammer) – under the tutelage of Professor Perlman (Stuhlbarg) – and the professor’s curious son Elio (Timothée Chalamet). 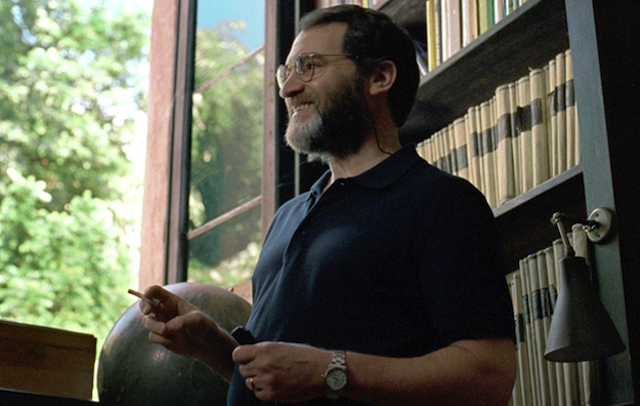 Stuhlbarg’s role is one of commentator throughout the film, until a climatic monologue that assures his son that whatever is right for him is right for everybody. The film is a emotional alternative to the holiday blockbuster. Michael Stuhlbarg was born in Long Beach, California, and studied acting at UCLA, as well as overseas in Lithuania and Britain. He made his debut film in 1998 in “The Price of Rubles,” and broke out through the Coen Brothers’ “A Serious Man” in 2009. Since that time, he has become somewhat of a go-to character interpreter for historical figures and other centerpiece roles. He has worked for directors Martin Scorsese (“Hugo” and “Boardwalk Empire”), Steven Spielberg (“Lincoln”), Woody Allen (“Blue Jasmine”) and Guillermo del Toro (“The Shape of Water,” recently released). 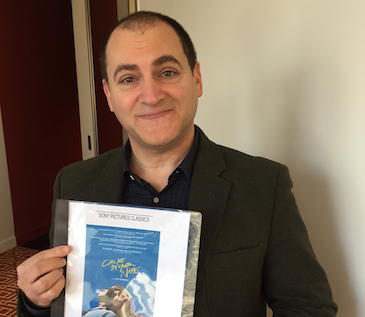 Michael Stuhlbarg sat down with HollywoodChicago.com to talk about “Call Me By Your Name,” both in character and themes, plus the craft of interpreting the character. HollywoodChicago.com: You disappear into your characters so succinctly, what key research do you usually apply that allows you to understand the roles that you take on? Michael Stuhlbarg: It changes with each job. It starts with the script in front of me, and what it offers. I try to absorb as much of it as I can, in the time that I have to study it, and I like to change things up, if I have a choice in the matter… and I usually don’t. [laughs] I dream on it, write about and find out who the individual is, and try to bring him to life with as much human and truth as I can. HollywoodChicago.com: Professor Perlman is like a floating Greek Chorus in this film, what do you find fascinating about academics or any über-intelligent character as far as capturing their lineage of knowledge? Stuhlbarg: First, what is it – in the thing that they do and study – that excites them? With Professor Perlman, with his archeology, texts and art history, he reminds us that these ancient peoples were alive and had passions, in addition to expressing their love for the world in how they expressed themselves. The is the clue to any academic, in that there is something that moves them profoundly, and allows their lives to make sense to them. HollywoodChicago.com: This film deals with a touchy subject, a teenage boy seeking his sexual identity and an older man using his charms to allow that expression. In a European sense, does that seem more likely to occur with this family in 1983 [the time setting for the film] than a typical living-in-America family? Stuhlbarg: It’s hard to know, but it was a different time. I don’t think it has anything to do with a European or American family, but the world at large in the early 1980s. It was a more innocent world as we imagine it to be. In that sense, there was more freedom and leniency in some areas of thought, which was closer to the looser nature of the 1960s. That was the time setting for the film, and the relationships reflect that time. HollywoodChicago.com: You have a monologue in the film that perhaps will become classic as the years go by. How do you approach what you know will be a key line of dialogue, and what was the collaboration between you and director Luca Guadagnino in getting it right? Stuhlbarg: You never know how some moments will affect an audience… what may be important to you may not even move other people. In this case, however, there is a profound response to that monologue. I had the fortunate experience of having Luca shoot this film in chronological order to that point. I got to live with the character and text for a longer period of time, so it was the very last thing I shot near the end. The emotions, dreams and thoughts in working with the character, and the relationships I had with the other actors, it all informed what I got to say. I had to establish presence… explore it as much background as I could with the time I had, and in the moment I had to shoot it try to be absolutely present. HollywoodChicago.com: Judaism plays a background role in ‘Call Me By Your Name,’ and is part of the identity that Elio is seeking. In your own experiences in being Jewish, how do you relate to the struggle of the family and their son as identifying openly in the religion? Stuhlbarg: Yes, those are described as ‘Jews of discretion.’ [laughs] In my youth at that particular time in the 1980s, I remember the movements of never forgetting what happened during the war, celebrating who we were, embracing new thought from the 1960s and the reform ideas at the time. All of that provided a background of pride for me at that time. In America, we could celebrate our differences, but still be united as a country of mixed cultures. In the audio portion of the interview, Michael Stuhlbarg speaks about “The Shape of Water,” the philosophies of the directors he has worked for, and what he would teach in an acting class.